"It is amazing how working out and healthy eating can change your life. Take it day by day you never know where it may lead you." It all started on a bet. Mike had attended a business meeting in Chicago and ordered the famous deep dish Chicago style pizza with a favorite craft beer. His business counterpart Rob Hayes jokingly stated, "You look like a keg with two legs". This comment spurred a bet between the two men. They each had to lose 25 pounds in 3 months or they had to donate $1,000 to the charity of the other person's choice. This was January 2017. Although the bet jump-started the lifestyle change, Mike had also recently been to the doctor. He had high blood pressure, high cholesterol, and was pre-diabetic. His doctor put him on the "feathers and fins" diet, primarily chicken and fish. He wanted to lose the weight in a healthy manner so it would stay off. 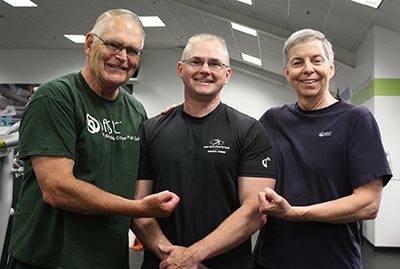 Along with changing his diet, he and his other business partner, Fritz Teutsch, continued their workouts with West Hills' personal trainer, Tyler Norman two to three times per week. They also started conducting their morning meetings on West Hills' track. Mike’s energy level was higher than it had been in years. After months of watching what he ate and exercising, Mike returned to his doctor. He stepped on the scale and saw that he had won the bet. He was also no longer pre-diabetic, nor had high blood pressure or cholesterol. Mike’s business counterpart had also lost 25 pounds, so they both donated $1,000 to each other's charities. Both Rob and Mike have lost over 40 pounds since they started the bet. They will continue to keep the weight off. Mike will be 70 in 18 months and he has a new goal in mind before the big birthday. "I am going to be training to be a powerlifter and lift competitively in the 70 and over class. Tyler will be my coach."